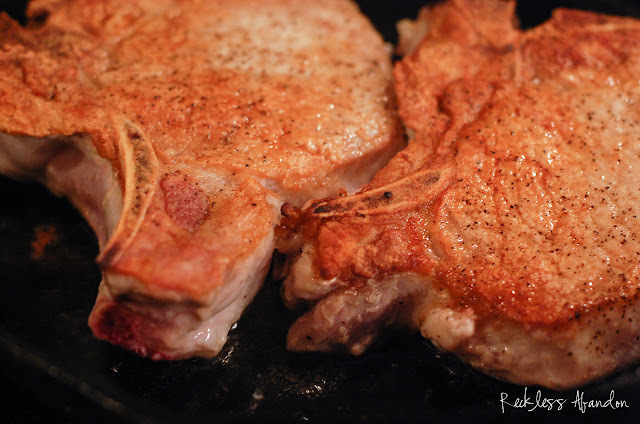 The best choice for pork chops is bone-in thick-cut 99% of the time. They are generally thicker and tend to not overcook as much as a thinner, bone-out cuts. This recipe, from Food Network Magazine, has a simple but wonderful mushroom and green onion gravy to pair with your pork. I served this dish with pureed parsnips (a recipe coming soon) to take the place of carb-filled mashed potatoes. They were silky with an earthy flavor from the under-utilized root vegetable. This is a quick recipe for a weeknight meal. 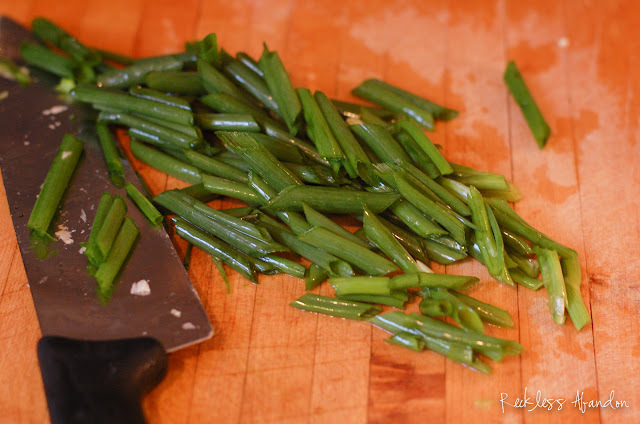 First, cut your green onions (green parts only) at an angle into 2-inch pieces. Slice your mushrooms if you didn't buy pre-sliced and chop the 3 cloves of garlic. 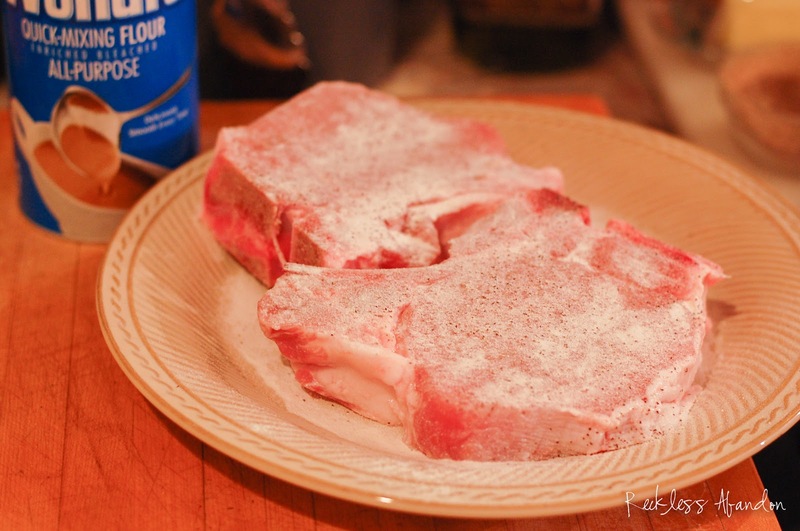 Season the pork chops with salt and pepper and sprinkle (or dredge) in the 2 Tbsp flour. In a large skillet heat 1 Tbsp olive oil over medium-high heat. 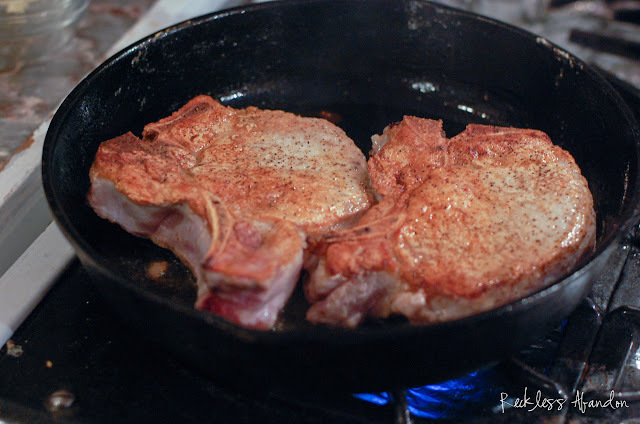 Cook the pork chops 2-4 minutes per side until golden brown and cooked through. I always use an instant read thermometer when cooking pork or beef. It's very easy to overcook pork and then it is tough and undesirable. Once the pork chops register 145 degrees in the center, remove from the pan and set them to rest on a plate tented with foil. Work in batches of two if you are making four pork chops. Heat the remaining 1/2 Tbsp oil in the skillet and saute the mushrooms, garlic, scallions and a pinch of salt until the shrooms start to brown. 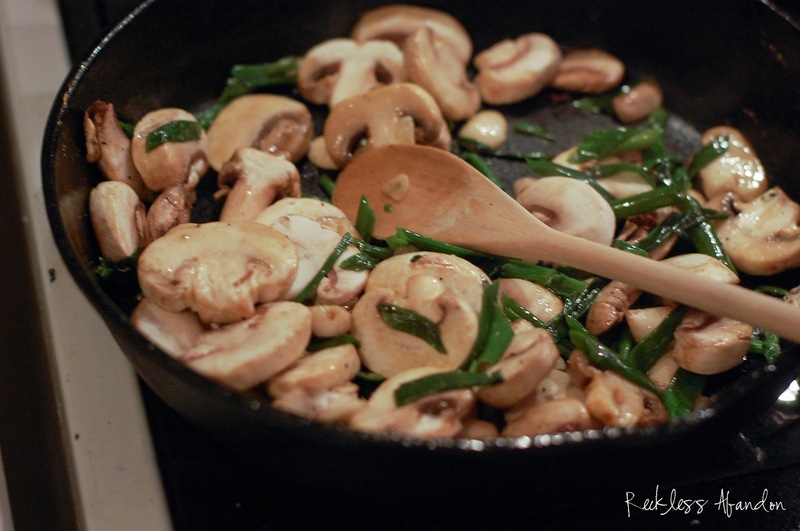 Sprinkle in 1/2 Tbsp flour and stir to evenly coat the mushrooms and scallions. 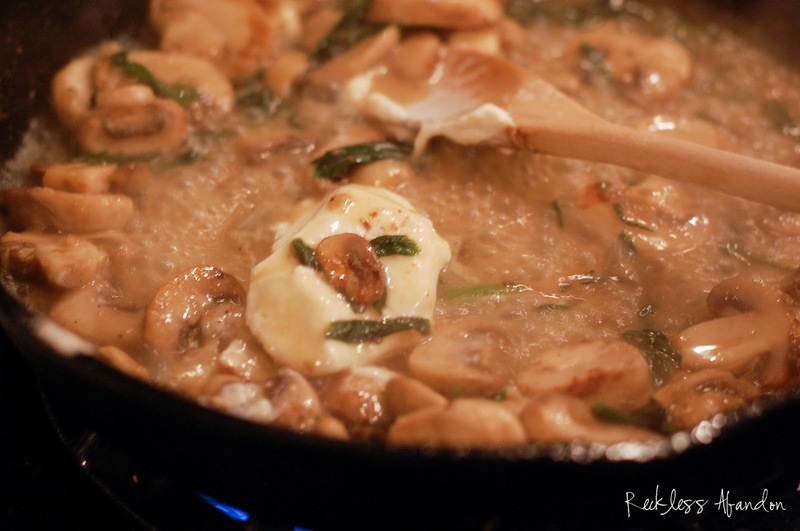 Saute, stirring constantly for another couple of minutes until the mushrooms are softened. Now, stir in the 1/2 cup chicken broth and 2 Tbsp low-fat sour cream (or greek yogurt!). Turn the heat up if necessary to bring the sauce to a simmer. Simmer for about 1 more minute until it thickens. 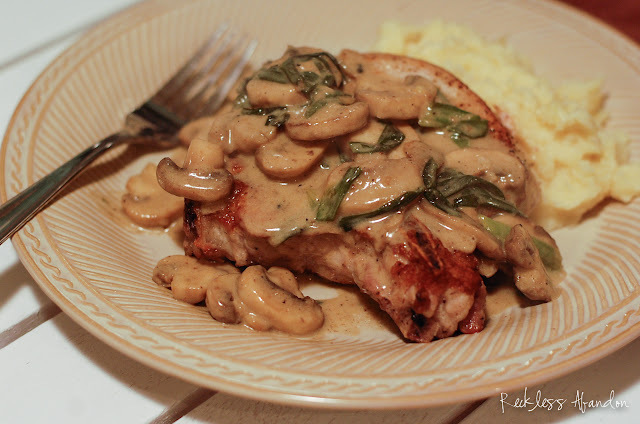 Serve the pork chops topped with the mushroom gravy and enjoy! This would be amazing with mashed potatoes or even better...a parsnip puree! I just found your blog & I'm in love with it! everything looks SO delicious and so easy!! Made the porkchops.....EXCELLENT! My hubby, who isn't a big fan of pork, even liked them!